Ever try and use a laptop in coach? It’s pretty difficult, especially if the jerk in front of you leans back. No longer! For Episode 5 of the Ben Heck Show we built the “Coach Section Laptop” – a modified Toshiba Satellite that can transform to fit your needs! Sha-zam! The rebuilt screen portion has sliding arms that let you move the screen closer to you, and knobs to lock it into place. You now type “under” the screen, allowing you to look busy on the airplane to impress other people even though you’re just scrolling up and down the same spreadsheet for hours. If your flight has WiFi, you can also order things from Sky Mall while in the sky. All it needs now is a cupholder for your half can of soda. For some more pics and a video, check the rest of this article. To see how we put this together, don’t miss Episode 5 of my show airing Monday November 8th! Side view. The cord isn’t as long as I had hoped, but this was as far as I could extend it without losing signal. I’m sure a company could build it into the arms with no trouble. 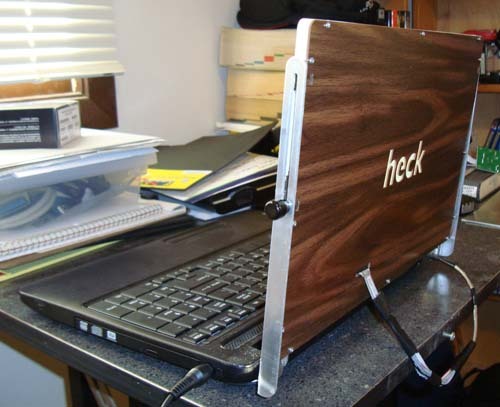 The back of the LED-lit screen is also illuminated, which I used to make a glowing “heck” logo, which is automatically 10,000X cooler than a glowing chuck of half-eaten fruit. Side / rear of the unit. The arms are.080″ aluminum with slits down the middle. Size 6 screws are attached to the LCD portion and are tightened by the black knobs. This is actually an improved revision since we filmed Episode 5 (it did not have the slits then and was much harder to use). Again, to see how we put this together and the wiring challenges, check out the latest episode of The Ben Heck Show! Cool. 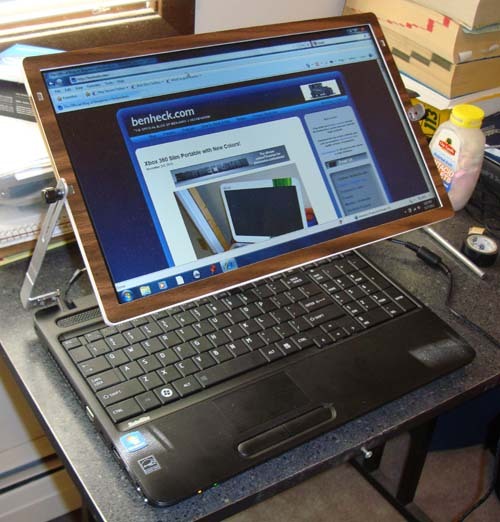 If it had a touchscreen you could flip it on top of the keyboard and use it as a tablet. 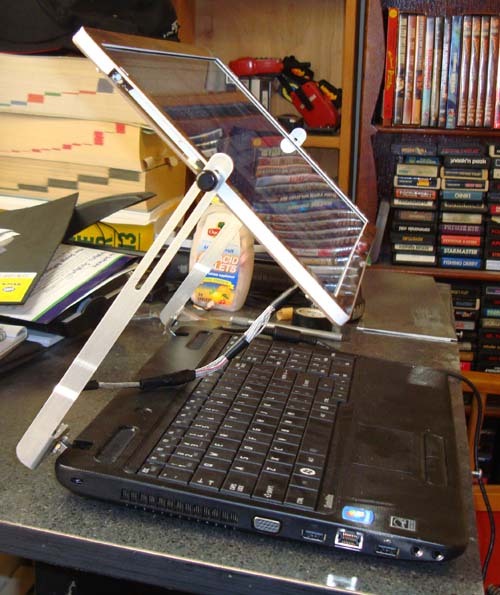 Dont forget to patent this, I could see this catching on as standard equipment on a laptop. Also copyright the idea of a rising tilting screen. Like Brandon said, get a Pixel QI touch screen and you’ll kill. Do it fast man, before Dell’s (Inspiron Duo) takes off. Hearing that tune from the Transformers (’86) soundtrack in the background absolutely made my day! Not that I’m knocking it, it’s a shame that form factor didn’t catch on more than it did. It would be very handy in situations like the example in the video. Also very conductive to flipping the screen down to use as a tablet. IMHO, that is the obvious next step in to this hardware hack. how much does it cost to setup the case holder? It is a great hack. I like the idea that the laptop will be able to fit into its bag again. Just be careful not to damage the screen cable. Okay Ben, that’s it. 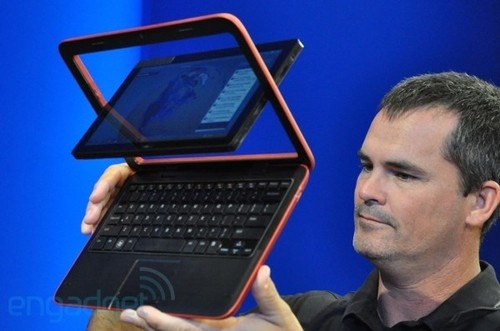 You’re the one who should be in charge of designing a real dual-screen laptop that is convenient. You are the chosen one. Next step, incorporate a Wacom tablet in a laptop, who needs keyboard anyways. I was jst wondering if Mr. Heck works on all lap top consoles or does he let his team work on them and if it’s a lot easier and takes less time to make them now since the slim versions have come out with the exception of the WII. You have made every coach traveler’s dream a reality! Very nice work! 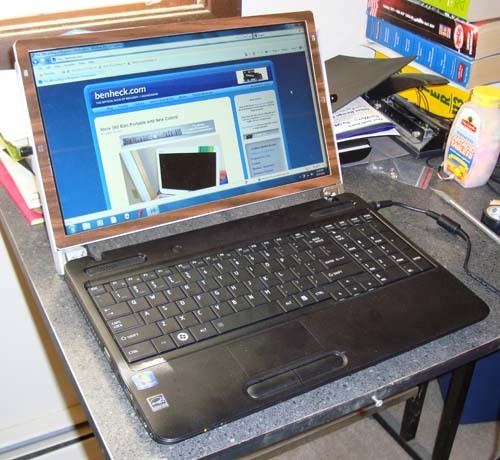 Pingback: DIY Sliding Laptop Screen « My Travel Across The WEB…..